Tin Soldier are the premier manufacturers of historical and fantasy figures in Australia. All 15mm and 25mm ranges are also made under license in the UK . Our miniatures are available world wide via an efficient mail order service or from selected overseas outlets. The 15mm ranges are illustrated with scanned images of actual figures. The 25mm ranges are illustrated with photographs of painted samples. Many of the figure codes are supplied with variations which are packed at random. These variants can sometimes be a figure in a different position but usually will be a head or helmet variant. In 25mm ranges, the number of variants is denoted by a “V” and a number following the figure description; ie; “V4”. All figures in both scales are supplied with weapons. In most cases, especially in Ancient period ranges, the weapons are supplied separately. 25mm figures are sold individually. 15mm are supplied in packs. Please refer to the pricing and packaging section for pack content details. Please take your time to browse the website and if you are not sure about something or you have a query, please contact us. ( see contact heading on menu bar). When you have made your selection, the totals will display on the SECURE shopping cart facility. Complete your details and method of payment and your miniature reinforcements will be on their way to you as soon as possible. HAPPY GAMING. Please let us know if you have any problems accessing or using the website, if you spot something you think doesn't look right, please let us know (politely!). We value your feedback. New Range Added - 25mm New Kingdom Egyptians - Listed under the Ancients Section for full range details and pictures. Tin Soldier has a large range entitled "THE SUCCESSORS", covering the states formed by the breakup of the empire of Alexander the Great. 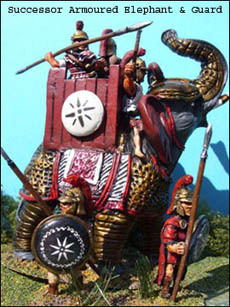 Armoured elephants, scythed chariots and exotic troop types are all available for you to build your Seleucid or Ptolemaic armies. We are offering on SALE a selection of our ELEPHANT SETS READY PAINTED FOR ONLY £22.00. To buy these go to our painted website www.hchfigures.com folow the link on our home page. See Successors under the 25mm Historical Section. READY PAINTED SHIPS -Generic ancient decked Trireme type ship, suitable to represent Persian or Phoenician fleets for the period approx 450BC - 150BC Reduced to £29.95, a saving of £20.00 each. To buy these you must go to our painted website www.hchfigures.com follow the link on our home page. See Ships on the Main Menu for full details and photographs. We have added a few extra codes into the Lydian/Ionian Greek range, followed by a range of GOTHS, VISIGOTHS & VANDALS. These represent the waves of invaders who pushed their way into the Late Roman Empire and eventually set up their own states in the West and in Africa. Ideal opponents, would of course, be our Late Imperial Romans. There will be more new ranges later in the year. As they say "watch this space"!